Here is a fight for revenge against a betrayal, and you must help him out. Frima Studio launches this high-precision real-time strategy game Zombie Tycoon 2: Brainhov’s Revenge that contains rigorous, fierce and brutal fights but also leaves a lot of scope for imagination and intuition. You get to deal with a number of undead zombies as the formula of bringing them into action is what the game is all about. The main characters are Dr. Archibald Brainhov and his lab assistant Orville Tycoon who become the worst enemies since when the latter ditches the former and takes away the formula of making the zombies in order to reign the world with his powers. But Dr. Brainhov isn’t that weak to let him go that way. So the story of the revenge begins. It is now an issue of putting things back at place and fight for the power of the one on the other. Once you are ready for the mass killing of zombies you cannot afford to let lose your brain and alertness. Every second counts and adds or subtracts your chance of going ahead with the levels in Zombie Tycoon 2: Brainhov’s Revenge. In your control there will be more or less two teams of zombies, a zombie-making character which would be the first Tycoon and a monster with his own set of capabilities. You may get to meet Dr. Brainhov a little bit later in the game. Your zombie team will have five members in each who will get replaced whenever you want them back. You will be automatically placed in a battlefield where the two teams will be showing their skills and capabilities, while fighting for their own cause. Your goal is to complete the set of tasks that is given on each level. The setting is on the ruins of Finkleville, the streets will be filled with signs of devastation and destruction, which earlier might have had all the marks of prosperity like the buildings, theaters, martial arts centers, hardware outlets, sports grounds and so on. In one of those structures you can turn your zombies into still better units of efficiency and power. There in the houses you’ll get roaming zombies whom you are not supposed to control yourself, as they have their automatic powers to protect their place from external attacks and finally participate in the “dead rushes”. If you want to share the experience with your friends, invite them in the Deathmatch mode. Or you can also play with a stranger if you don’t mind. But the only thing you have to watch out for is to use “offence” as the best “defense” if you don’t wish to lose the war and hence the game. The entire gamut of Zombie Tycoon 2: Brainhov’s Revenge is all in all entertaining without making it utterly stressful. The interface works without faults and it has loads of fun to shun down the zombies in a nice and presentable manner. A well-tuned game with engaging visuals and storytelling. 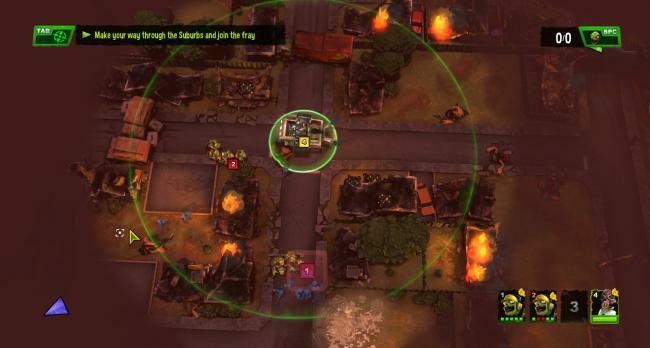 The real-time strategy appears to be oversimplified at times.